There’s nothing quite like the feeling of setting off with a full tank of gas, open road and lots of adventures ahead of you. But road tripping ain’t always cheap. Gas can add up and eating on the road will start to take a toll on your wallet (and waistline!). If you don’t stay on top of your spending, you could be looking at crushing your budget in just a few days. We made our own DIY campervan on a super tight budget, but we knew that if we were going to be on a 3-month road trip around the western United States, we were going to have to watch our spending very carefully. Along the way, we picked up tons of super handy money-saving hacks and tricks that allowed us to have an incredible and inexpensive road trip around the US that we'll remember for years. We're sharing our creative and practical advice with you so you can have the road trip of your dreams without spending a fortune. This advice will be helpful to you whether you're on the road for several months or are on a short weekend getaway; and whether you're sleeping in a campervan (like us! ), an RV, a tent or hotels. So what are you waiting for? Let's go over some practical and creative ways you can take a super cheap road trip without sacrificing fun! Food is the first money-saving category on our list because it's always on our minds. Trying new foods is one of the best parts of road tripping, but it can add up quickly. During our 3-month road trip around the western United States, we came up with tons of ways to save money on food, while not denying ourselves of trying new dishes along the way. We're sharing all the ways we saved money on food during our road trip. Eating out for every meal will drain your wallet more quickly than betting on the lottery. Eating out is part of the fun of traveling, but only do so at places you don’t have at home. Research the restaurants in towns you’ll be passing through, and make an effort to dine at those that are super unique, serve up local specialties or are places that residents rave about. Those are the eating experiences that you’ll remember. Avoid places like McDonald’s (unless you need Wifi and an ice cream cone!) or chain restaurants that could be in any city. 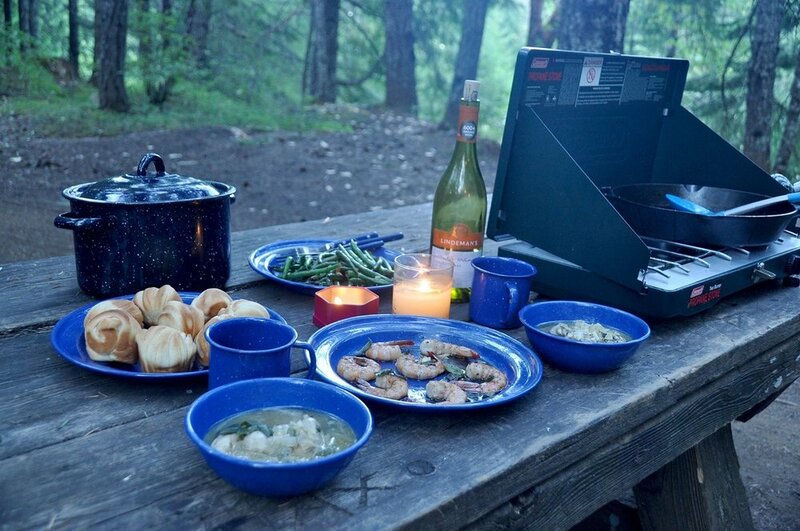 Having the ability to cook meals along your road trip can save you hundreds of dollars along the way. Plus, you probably won't want to be stuck going to Taco Bell and Hardee's for every meals because there's no other option. 1. 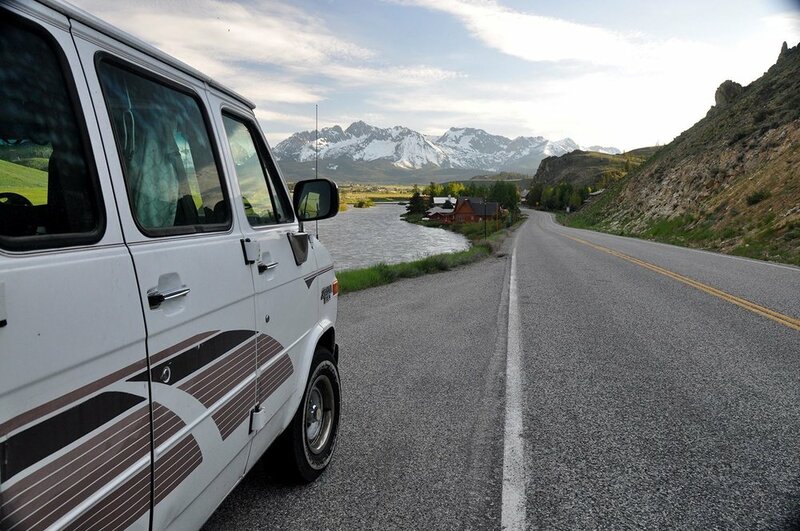 Traveling in a campervan or RV: Lucky you! Cooking a variety of meals will be really easy. Be sure you have lots of spices to add variety to your cooking. If you have lots of options, you'll actually want to cook instead of getting bored with campervan food. Also, pack plastic containers so you can save leftovers or portions of unused vegetables to prevent waste. A good knife will go a long way. Check out everything we included in our kitchen conversion! 2. Traveling in a car: This will make cooking a little more tricky, but it's definitely doable. A cutting board and a good knife will make it possible to snack on fruits and veggies, as well as have fresh salads for meals. Even if you don't have a stove, a cutting board and knife should be on your packing list. Mini Backpacking Camp Stove: It is tiny, so it hardly takes up any space. This is best if you have a small car or are planning to go on backcountry trips. You will only be able to cook simple meals with this device. 2-Burner Coleman Stove: This is what we had in our campervan, but if you have a larger vehicle, it is a good option. You can cook a couple things at once, and it will allow you to use bigger pans and cook more interesting meals. If you’re a coffee drinker like us, pack your own French press and favorite grounds. It doesn’t take up much space and it will save you time and money from stopping at Starbucks every day. Get a large water jug and fill it up at parks, campgrounds and drinking fountains to avoid buying new bottles all the time. We kept two large jugs in our campervan that we used to fill up our reusable water bottles. This saves money and plastic waste too, which is a huge plus. Picnics can be super cheap and will allow you to enjoy your lunch with a view. Picnics will be so much better if you’re prepared and pack a blanket, a small cooler, utensils, plates and perhaps even a bottle opener (for all that wine!). Have a couple "reserve meals" that don't require much preparation in case you end up somewhere where everything is way overpriced or closed. One idea is gnocchi and pesto. It requires just a few minutes on the stove, and both ingredients are shelf-stable and don't need to be refrigerated. If you have other ingredients, you can add them, but it's fine on it's own too. "Reserve meals" may not be our favorite on the road, but they have saved us when we arrive in a campground late at night and the only option is overpriced (and gross!) gas station sandwiches. If you are anything like us, trying local breweries is something you look forward to on road trips. It’s a fun way to experience the local vibe and support small brewers. We typically get one pint at a brewery to enjoy the atmosphere. If we like the beer, we often fill up our growler instead of ordering a second. When there's a local specialty or an ice cream shop that looks amazing, don't pass it up. But if you want to keep under your budget, split it with your travel companion (if you have one!) so you can both try it, while only spending half the money. If you’re road tripping far from home, chances are you’ll be shopping at grocery stores you don’t have in your neck of the woods. Many big chains, like Safeway and Kroger, have free loyalty cards that give you discounts on all your groceries. We were surprised how much money we saved by getting a Safeway card while traveling on the west coast. On a previous trip out east, we saved a ton of money with our Kroger card. We are admittedly addicted to “TJ’s”, as we lovingly call it. But we have found Trader Joe's has some of the best deals on healthy snacks and staples. Plus, samples… need I say more?! If you’re staying in hotels on your road trip, try booking some that include free breakfasts. This eliminates one meals each day that you need to pay for on your road trip. Use our favorite hotel booking site in the USA. We love staying in Airbnbs for many reasons, one of them being the access to a kitchen. This allows us to easily cook our meals so we don’t feel the need to eat out every time we get hungry. It’s a good time to get great deals at some of a city’s best restaurant and gives you the chance to brush shoulders with the locals. A lot of times the top-rates restaurants on Trip Advisor are the more expensive restaurants locals seek out on special occasions. But if you’re on a road trip, “special occasion meals” every night will add up FAST. Asking where locals flock on a regular night out is a good way to find hidden spots that are reasonably priced and not packed with the "Trip Advisor tourists". If your road trip falls over some weekdays, check out the town calendars to see if there are any local specials. Often times there are fun events, like Trivia Nights and many small restaurants even have a local’s night where they have a special, less expensive menu. If there’s a restaurant you just have to try, go there for breakfast or lunch instead of dinner. This is a great way to try the restaurant while having budget friendly meal options. Pack high-protein snacks so you can keep hunger at bay and aren't tempted to get that box of gas station donuts in a moment of weakness. This will help your waistline and your wallet. You’re welcome. A good cooler will keep your food fresh, less waste and less ice. We wish we had a more insulated cooler when were going through the desert of Utah in mid-June. Believe me, we won't be doing that again. Plan out meals a few days ahead so you can avoid wasting food. You can also make a big meal at dinner time and then have it again at lunch the next day. That way you only have to cook once. On our 3-month road trip across the western United States, gas was our biggest expense by far. It adds up quickly, especially of you're driving a big rig, like our campervan, "Vinny". We're sharing our best advice for saving money on gas. Plus, we've got a few money-saving tips for you if you will be renting a car. Our favorite is to use Google Maps (because we always have it open on the road anyway!). Type “gas” in the search bar and you’ll see where the nearby gas stations are along with most of the prices per gallon. Sometimes it’s a matter of a few cents difference, but there were more than a few times where we saved a ton! Once, we found gas for $2.60 per gallon when most of the gas stations nearby were around $3.80. We had to drive a half-mile out of the way, but we saved more than $10, so it was completely worth it. We secretly get really excited when we save money on gas. One great app to save money on gas is Gas Buddy. Simply input your location and Gas Buddy shows you the cheapest gas around you. This app alone can save you hundreds of dollars when traveling across the USA. Pro tip: Most gas stations off the highway are more expensive than those just a short drive off the main road. We found that Chevrons usually had the most expensive gas in the Western United States, while AmPm, ARCO and Maverik had more reasonable prices on average. Map out where you're going so you don't have to backtrack. Getting lost along the way can be part of the adventure, but that extra gas money can add up. We have told you why we never travel overseas without travel insurance, and we think it’s just as important to have really good car insurance before setting out on a road trip. Choose a policy that offers emergency roadside coverage, so you’re not stranded in the middle of Utah after overheating. Our policy, for instance, covered towing over 100 miles, while others only cover under 5 miles. Some policies even cover hotel stays until your vehicle is fixed. Do your research and find an insurance policy that fits your needs. Do your budget a favor, check over your car and make sure your tires are at proper air level and make sure your air filter is clean. Both can affect your gas mileage. Also, make sure you’re staying on top of oil changes along the way in order to avoid car trouble on the road. Before going on a road trip, do some research and consider opening a new credit card that has good rewards for gas transactions. You’ll be filling up your tank a lot, so it is nice to get a little something back. If you’ll be eating out much of the time or staying in hotels, consider a card that rewards for those purchases as well. In you Google Maps settings, check the box that says “avoid tolls”. There are some cities where tolls are unavoidable, but in others, these are only slightly faster and the tolls can add up quickly. One time on a road trip in Iceland, we accidentally paid a $10 toll by taking a road that was 2 minutes faster than one with no toll. In cities that are infamous for their tolls, like Chicago, do a little pre-planning, so you find the best route for your trip. In big cities, park outside the city and take public transport into downtown to avoid ridiculous parking fees. If you’re on a long-term road trip and need to get an oil change on the road, try Jiffy Lube. They have locations all around the United States and have $5 off coupons online, making them a good choice if you’re on a budget and can’t make it to your regular mechanic. One of the most expensive parts of a road trip is the gas. Sometimes a time crunch won't allow you to take it slow, but if time allows, slow down. This will not only mean you get to explore each place you visit in greater depth without being rushed, but you’ll also save money on your average gas cost per day. If you don’t have car of your own, or if you’re coming from out of the country, you might be looking at renting a car for your road trip. We like to use RentalCars.com to find a good deal. They compare all the top rental car companies and show you the best cars for you. Do you want to give van life a test drive? We’ve got an idea for you! We’d recommend getting a rental vehicle from Escape Campervans. They have 12 different locations across North America and come fully loaded with all the gear you need for an epic road trip. Plus, their rates are fair and affordable. When you rent your car, don’t buy the car rental insurance. It's one of the biggest unnecessary purchases of the industry. Not only is it wildly overpriced, but chances are if you have a major credit card, it already covers you. And some car insurances (that you already have for your car at home) cover rental car insurance too. So why waste your money being double or even triple insured? Check with your credit card company or car insurance company ahead of booking your rental car just to be sure. Find the right credit card for you from the list of the best travel credit cards. Accommodation is one of the most expensive portions of a road trip. We traveled the US in a campervan for more than 3 months, so we rarely had to pay for hotels. It saved us money and added to the adventure! In this section, we break down how to find free campsites as well as how to save money on hotels if camping just isn't you thing. Camping might seem like a cheaper alternative to staying in hotels, and it is. But sometimes it's not as cheap as you might think. Some campsites can cost up to $35 - $40 per night. If you're on a 3-month road trip (or just on a super tight budget! ), those accommodation costs can add up. Fortunately there are some ways to avoid these steep fees. National Forests are often much cheaper and sometimes free. Also, try searching for BLM land (Bureau of Land Management), which is free to camp on, but varies in facilities. Sometimes these sites have pit toilets, and other times BLM sites are primitive and don't offer any facilities. Stay in a Walmart parking lot! (No, we're not kidding!) Many Walmarts across the US allow customers to stay overnight in their parking lots for free. Bonus: You can use the restroom (this works best at stores that are open 24/7) and stock up on anything you might need. And head out first thing in the morning – it's not really a place you wanna linger, if you know what I mean! But before you park, be sure to read the signs in the parking lot and make sure camping is allowed in that particular store. To help you in your search for free campsites, try checking out freecampsites.net . As a graphic designer, I'll be the first to tell you it's not the prettiest website, plus it's tricky to navigate on the mobile version, but it is helpful nonetheless. You can plug in your location and it will show you a map of where to camp for free with reviews and camping amenities. Sometimes search results will include Walmart parking lots or sites that require a small ($10 - $12) fee, but we've used this site to find some pretty awesome (and FREE!) camp spots too. In big cities, like Miami, New York, Chicago, Las Vegas and LA, Hotel Tonight is a great money-saving app to try. How it works: Hotels that aren’t fully booked will offer up their vacant rooms to users of this app for a steep discount. The only tradeoff is that you can’t book too far in advance – 7 days max. But sometimes this works out well on a road trip if you don’t know exactly where you’ll be each night. Tip: If you do use Hotel Tonight, use our discount code: BZWEBER and you will $25 off your first purchase. We do get a bit of a kickback for this, but it doesn't cost you any more dough and you'll get a discount, so why not?! Be loyal to your favorite hotel booking system. Your loyalty will pay off with a free night or great deals. We typically book with Booking.com for hotels in the USA. One of the major perks for traveling around the United States in a converted campervan is you can park anywhere it's legal to park overnight and sleep there. Some people call this "boondocking". It's not always the most ideal situation (we prefer actual campsites), but it's great in a pinch when you're trying to save money on accommodation costs. If you're in a big city, you can pull up to a public park and use the public bathroom, and stay there for the night. Just be sure to check out all the nearby signage and look for "No Overnight Parking". If you don't see signs like this, you should be fine! Want more? We explain this scenario further in our Campervan Q&A video. What's a road trip if you never get out of the car?! Some of your best memories will be from the things you do on your road trip stops. But some activities can be extremely expensive. We've got some tips that'll help you save money on your road trip, while still doing some bucket list activities! Basically, if you plan to go to more than 3 National Parks in one year, this is a good investment. At $80 it is kind of expensive up front, but it easily saves you money in the end. If you plan to spend a lot of time in one state or region in particular, look into those state or local passes too. When you’re on vacation, it can be tempting to splurge on just about everything. Ice cream cones twice a day, expensive tours, more souvenirs than you can count… and pretty soon, you’ve spent way more than you were planning to. Know the difference between a bucket list-worthy activity and something you could do anywhere. Often times when we are in "vacation mode", we splurge more easily than we would at home because we're on holiday. That's fine sometimes, but it is a surefire way to blow your budget. But there are activities though that you may not have planned for, that you just shouldn't pass up because they only happen once in a lifetime. For example, when we were on Vancouver Island, we heard the whale watching was fantastic. We hadn't budgeted for it, but after a simple Google search of "best places for whale watching in the world", Vancouver Island repeatedly came up at the top. Even though this was a splurge we hadn't planned for, we realized that it was something we would regret not doing. It was an expensive activity, yes, but so worthwhile because it was special. Can I do this at home? Anywhere else in the world? Will I regret not doing this activity? Will I regret this splurge? Can I cut my costs elsewhere to account for this splurge? It’s not uncommon for these areas to be overpriced and full of rip-offs. For instance, many times there is free parking not far from paid parking. Sometimes you’ll see people charging a fee to take your photo when you can easily have a stranger take yours for free. And sometimes are often things for sale that aren’t necessary. For example, in Zion National Park, there are walking sticks and waterproof shoes for rent that many people pay for because, well, they see other people getting them when they are totally unnecessary. One of the most expensive parts of travel are organized tours. There are some activities or tours, like whitewater rafting or whale watching, for instance, that you just can’t do on your own. If these are important to you, plan these into your travels as splurges (see tip #34). But those double-decker buses and guided city tours can easily be replicated. Go to the tour’s website and write down their itinerary. Do a little research on each stop, and voilà – you’ve got your own DIY city tour! No matter where your road trip may take you, there should be a ton of free (or inexpensive!) activities to do. Simply Google “free things to do in [enter city name here]”, and you should find enough to get you started. Some free activities that we love seeking out are hikes, farmers markets, free live music, picnics, beaches and exploring art galleries, just to name a few! Still want more money-saving tips so you can take your dream road trip without breaking your budget? We've got you covered! Here's some more cheap travel tips just for you! This only applies if you’re traveling with your hunny (or a very, very close friend!). Most of the showers we found were between $2 and $5 and were not timed. In some cases, the showers are not in gender-specified rooms and we could shower at the same time and only pay once. It’s not always possible since sometimes the showers are inside separate bathrooms, and other times they are timed, so it would roughly be the same price. But if you can avoid it, skip traveling to popular places over holiday weekends, and possibly the week before and after. Las Vegas over the Fourth of July was a terrible idea, but we were still able to stick to a budget. If you're going to a notoriously expensive place, do a quick Google search like "Vegas on a budget" to get location-specific tips. You could find some good insider tips or every find deals on hotels, flights and restaurants. Think ahead of time what gear and supplies you will need. For instance, if you want to go from the desert to the mountains, you'll have to make sure you have the appropriate clothing for each climate. Or if you want to go backcountry camping, make sure you bring your tent and sleeping bags on your road trip so you don't have rent from an outfitter. 44. Need something sent to you on the road? No problem! How do you get packages sent to you while on the road? If you did forget something important at home (or you want to order some gear online) you can have a package sent to a post office using general delivery. Basically, you send the package to a certain post office zip code with your name and "General Delivery" below it. Here are some good instructions for the general delivery process. When booking tours and transportation, call the company and ask if there is a discount for booking in person or online. When we were headed to Vancouver Island and it was cheaper to just show up at the port as opposed to reserving the ticket ahead of time online. On the other hand, many times there is a discount for reserving in advance online. The magic number we try to stay under each day is $70 (for both of us). If we go over our budget one day, we try to make up for it the next day by spending less than $70. It's all about balance! If you have followed this blog for any amount of time, you know that we love keeping track of our travel budget. It is the best way for us to stay on top of our spending and hold ourselves accountable. There are many apps out there that can give you a visual of how much you're spending and what you're spending it on. We love Trail Wallet because it was designed by travelers and has some pretty sweet features. We see a visual breakdown of how much we're spending on food, gas, and even beer! Where are you headed on our your road trip? Have you used any of these tips before? What other money-saving road trip travel tips do you have? Please share in the comments below.